Multilingualism is the ability to speak and having the knowledge of two languages and literally even more than two languages. A child has an added advantage to born in a family with knowledge of multiple languages. 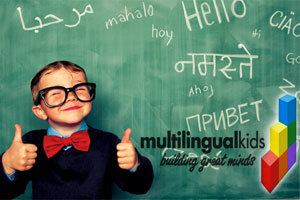 Raising a multilingual kid provides more benefits to the little one in various aspects. However, many parents tend to have a chaos in raising and helping their children with this multilingualism! Remember, raising a multilingual kid is completely based on how the family supports multilingualism, how they exhibit the multiple languages to the kids, how the languages are used, and totally based on a family environment. The parents and the family members may choose from the following options in raising a multilingual kid. Make it very clear to have a conversation with your kid in one language, like one person one language technique! For example, if the native language of the mother is Hindi, the mommy can talk to the child in Hindi and father can talk to kid in English. This technique works great in the family where the members are knowledgeable about various languages, beyond English. If the father’s native language is Mandarin and mother’s native language is French, you can teach these languages at home as the kid will learn English at school. In order to develop fluency and comfort in your kids to speak different languages confidently, you have to be consistent. Swapping the languages often won’t be helpful and it would definitely affect the vocabulary of the kids. If you speak Marathi, and you want your children to speak Marathi, you should speak with the kid only in Marathi to develop the vocabulary and fluency. This technique can be applied to develop fluency in multiple languages, simply, a multi-lingual kid. The one language – one person technique helps children to connect beautifully with all members in the household. It helps them learn different culture and practices. This is the technique where more than one person in the family speaks to a child in one language, other than native language. For example, if you have migrated to a different country than your native country, it is essential to develop the language skills of children pertaining to the nativity. Also, you may just want your children to learn an additional language. This can be taught as a minority language! It is quintessential to talk to your children with the native language besides you intend to develop multilingual skills in your children. Kids lacking knowledge in native language or mother tongue is a disgrace.